the main point being that all such lorries had to be made available to the military as soon as they were asked for. Many thanks, ' acquired ' is probably a better word to describe the Army's use of civilian vehicles. Two mobile 13 pdr. 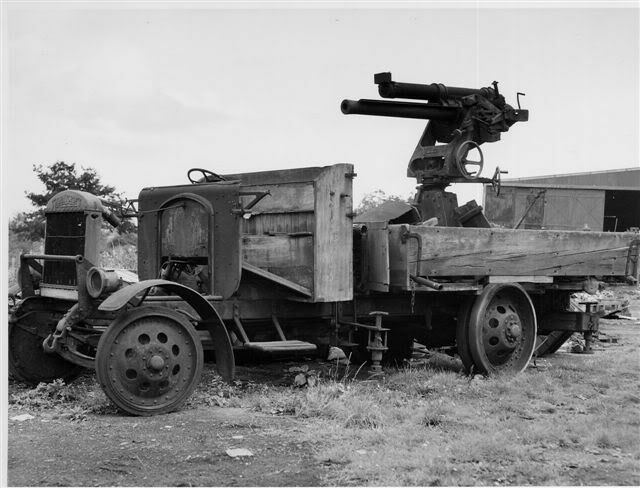 Anti-Aircraft Guns in action, mounted on Thornycroft lorries. We can see the Range Finder to the left, and also a motor cycle mid photo. This is the first time I have seen a motor cycle photographed at such an emplacement, although I am sure they were frequently used by Signallers and Despatch Riders. 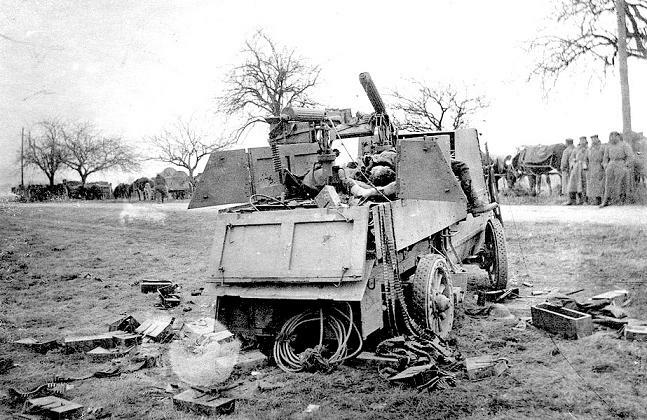 In stark contrast to the two Thornycroft mounted 13 pdr. Anti-Aircraft Guns fully in action as shown in the previous post, to the somewhat dismal scene of two Thornycroft Anti-Aircraft vehicles rotting away at some unknown location after their service life had ended. Follow up - member Andrew Upton has confirmed that this actual derelict Thornycroft ' J ' Type with its mounted 13 pdr. 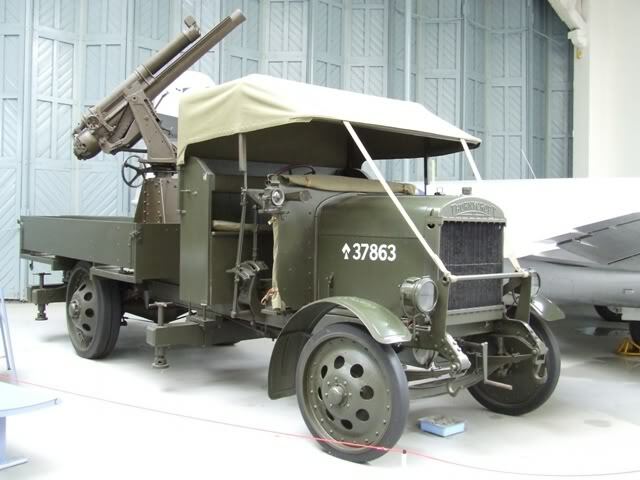 Anti-Aircraft Gun has been beautifully restored and is now on display at the IWM Duxford. Now we can enjoy the before and after photographs. A motorcycle was a standard part of the allotment for an AA Section, LF. 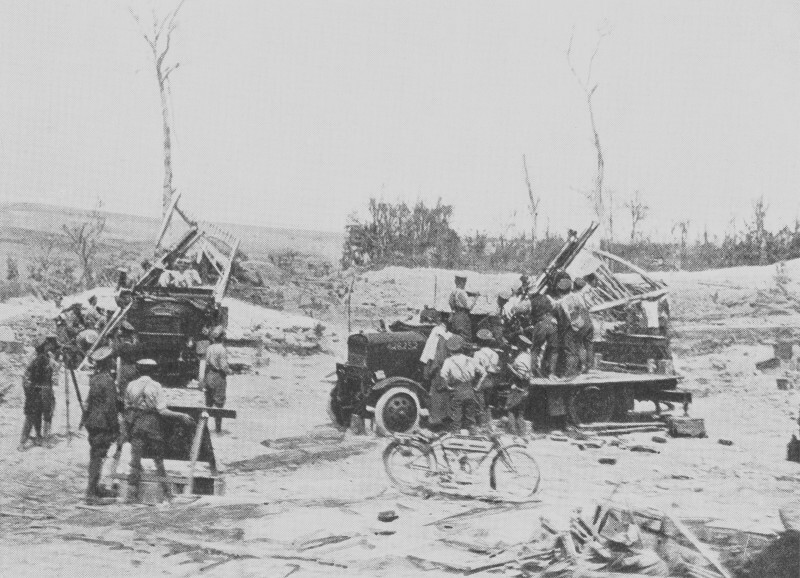 The Salonika Sections also had 3 x 3-ton GS lorries and a staff-car to start with. The lorries were replaced by 30-cwt Daimlers later and the staff-car was swapped for a Ford van - sic transit gloria mundi! The two guns in your photo are in action as the left-hand gun is at full recoil but the elevation appears different on the two guns so perhaps they're firing at more than one plane. I wonder whether they were en route as they lorries are not aligned, very close together and I've seen blankets over the bonnets in winter scenes before - plus the bike is front and centre. The men would have practiced getting the lorries into action quickly and each of the 11 men of a detachment had specific duties so they wouldn't get into each other's way. Many thanks for providing the additional detailed information to accompany the photograph, it certainly helps in building an accurate account of what is actually taking place. If that is actually the very same vehicle shown in that old photograph, then what a wonderful restoration, and great to know that old war horse will be available for future generations to share and admire. Had I thought it was still rotting away in that yard, I would have bought it myself! Yes, it is indeed the same one. Richard did a great job on restoring it. It runs and drives well too. A shame that it never goes out anymore. 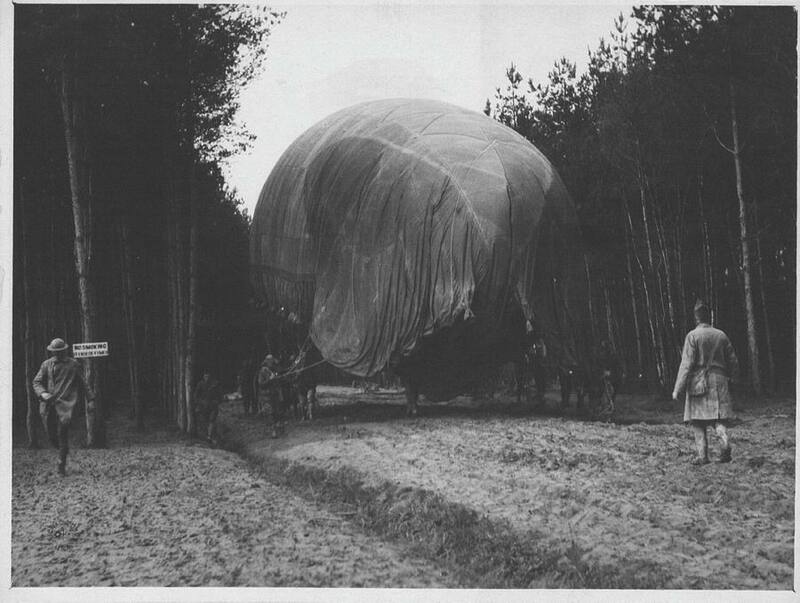 An Observation Balloon is man-handled into position through a forest somewhere is France. 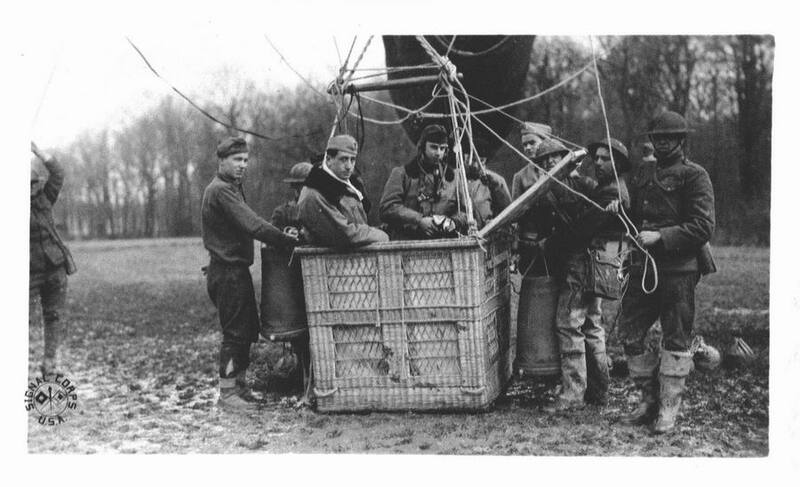 This photo, gives us a good idea of the size of the balloon. Note the large ' No Smoking ' sign! 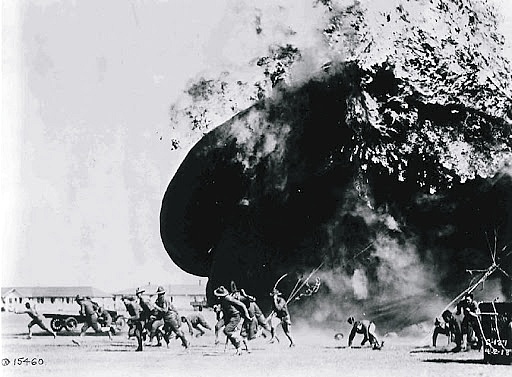 The danger of handling a hydrogen gas filled balloon, here we see an Observation Balloon exploding during a training exercise at an American base, Fort Sill on April 2, 1918. 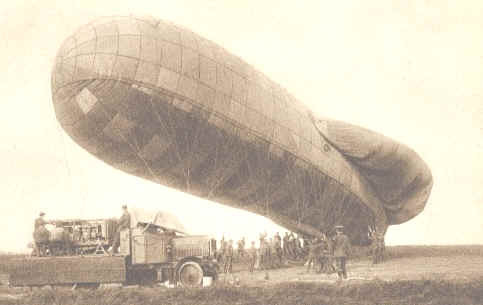 An American Observation Balloon preparing to lift-off. Thanks for the confirmation, do you know if there are any photographs taken during the actual restoration ? Now, it seems, what surely must be the last special purpose Army “j” will be broken up in the near future. Thornycrofts have asked several bodies during the last few years to take over their gun carrier, but nobody, so far, has shown any interest in it. Surprisingly, the engine was dismantled to supply spares for a customer only two years ago. Does anyone know who, what and when? It will be sad indeed if this tough old veteran is destroyed. Surely someone, somewhere, can find a corner for it to rest in. Restoration shouldn’t be too difficult either. Subvention chassis were essentially simple and robust and, of the thousands of “j”’s built there must be enough bits and pieces left to put this one back on the road. If anyone can help please write to us – not Thornycrofts – as soon as possible. Can you resist the thought of driving it down your street on a Saturday afternoon. I am not aware of there being any photos of this ones restoration. Pre digital camera age made taking photos quite expensive in comparison. Unlike today when every restoration has thousands of photos taken of every step of progress. Great background to this old battle wagon, thanks for posting. From the sanitary image of the Motor Machine Gun Battery vehicle shown on card No.22 ( post # 54 ), to the horrific image of one destroyed and the occupants killed, with the enemy looking on. At Pronville, the Germans erected massive and elaborate ferro-concrete ( steel reinforced concrete ) tank traps with gaps large enough for a motor vehicle to pass through, but too small for a tank to pass. Unfortunately for the Germans, Pronville was attacked and taken without the use of tanks. Reference to post 566. Powerful stuff, is it me or do they in a way look very much like a modern day ​JACKAL? Once again thank you LF. Back on my laptop soon hope to add to this thread soon. Do you mean the enemy soldiers, standing around looking on ? If so, I am sure they became somewhat immune to such things, seeing them as they did on a daily basis. Many thanks, I know nothing at all about present day military vehicles, however, I can certainly see Scalyback's comparison with a heavily armed light patrol vehicle from WW1 and its modern day 2008 counterpart. I've not seen a photo of the vehicle on the card. Did they exist ? 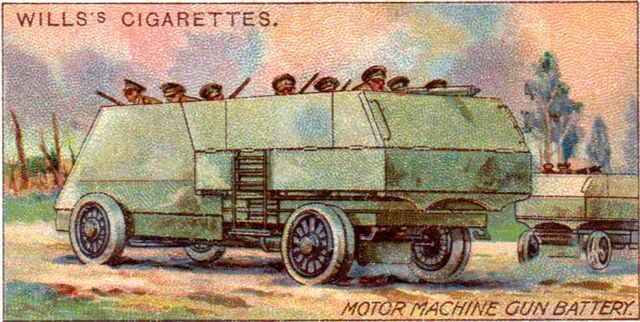 Yes, they did exist and the card shows the artist's impression of rear of the vehicle. See also posts # 58 - #107 - # 187. Known as the ' Autocar ', these armoured cars were the brainchild of Raymond Brutinel, who ended WW1 as a Brigadier General. The ' Autocar ' armoured cars were developed in Canada, made in the U.S., were shipped to England and then used on the Western Front by the 1st. Canadian Motor Machine Gun Brigade. One of the original ' Autocars ' is on display in the Canadian War Museum. Here is a drawing of the Autocar, and some additional photographs. 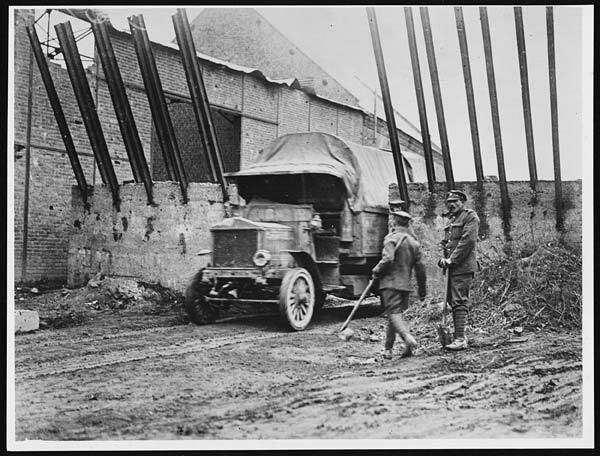 The bottom 2 photographs show the vehicles equipped with Colt machine guns, which were later replaced by the Vickers machine guns. 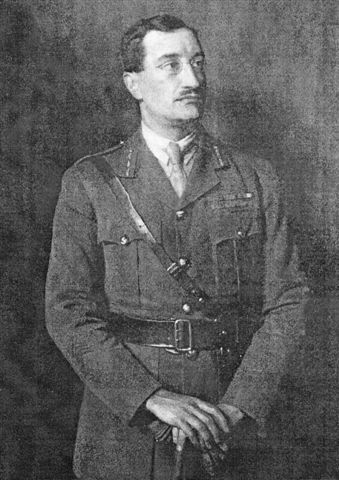 Brigadier-General Raymond Brutinel, D.S.O., inventor of the ' Autocar ' Armoured Car, and first to command the Canadian Motor Machine Gun Brigade.
" Raymond Brutinel, who died in France at age 82 in 1964, altered forever the face of war. An as-yet unpublished book tells how Brutinel, a reserve officer in the French army, made a fortune in Canada (Edmonton), and with Sir Clifford Sifton and others when WWI started financed the formation of what was to become the 1st Motor Machine Gun Brigade, (the Emma Gees), commanded by himself. More than any of his generation, Brutinel saw the machinegun as the weapon of the future and the motor car as potential mobility on the battlefield. Unlike soldiers of that day, he didn’t view machine guns as a weapon supporting infantry in defense, but visualized them in batteries of four or eight, firing day and night to inflict casualties behind enemy lines. “Bullet artillery” he called it. He had studied the 1904 Russo-Japanese war in which Japanese batteries of eight machine guns tore attacking Russian infantry to shreds. The British ignored the lesson. 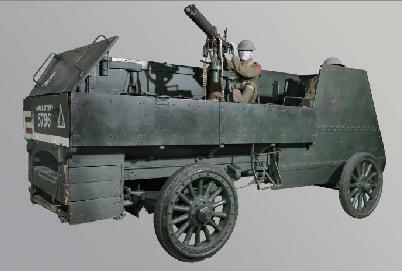 Brutinel had motor cars equipped with armor plating, mounted with Colt machine guns (later replaced by Vickers machine guns), able to move wherever necessary to plug gaps in the battle line. To harass the enemy’s rear, or to attack. The manuscript of Brutinel’s life, plus his memoir of the war (recorded by the CBC for their archives), was written by Dominique and Jacques Baylaucq, with the support of Brutinel’s daughter, Raymonde, who was born and married in Canada. (Jacques’ Swiss-born father-in-law, Andre Bieler, was gassed with the Princess Pats in WWI and became a well known artist in Canada and headed Fine Arts at Queen’s University). After the war, Brutinel returned to Canada, to find the Montreal lawyer he’d trusted with his affairs had lost all his money, become a drug addict and committed suicide. Brutinel returned to France and rebuilt his fortune. In WWII he became a significant figure in the French resistance, rescuing escaped British PoWs and downed airmen, and harassing the German occupiers. In 1918, my father was in the Motor Machine Guns and attributed to Brutinel theories applicable to tank warfare that the Germans adopted in WWII. It strikes me that the Royal Canadian Armoured Corps Association (RCACA) are the logical ones to get the Brutinel book published, as it really marks the beginning of mobile armored warfare. 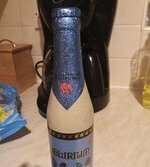 Brutinel is mentioned in war histories, but usually only in passing. The British weren’t even making the machine guns that Brutinel wanted. His Motors were orphans – their value recognized only by the Canadians (and Germans). As British casualties climbed in 1916, High Command urged a reduction of machine guns in a division in order to maintain the balance of rifles. Brutinel argued that with shortages of manpower, machine guns should be increased to maintain fire power. After Vimy Ridge, 1917, Brutinel persuaded Marshal Ferdinand Foch, Supreme Allied Commander, that the Canadian Corps was “second to none” and had never lost ground they didn’t recapture, within 48 hours. Foch used the Canadians – whom the British resented for their independence and for not integrating with them like the Australians. In March, 1918, when the Germans broke Allied lines, the Motors fought a 19-day running battle on a 35-mile front, covering the chaotic retreat of the British 5th Army. In the last 100 days when the Allies broke the German lines, the Motors again led the attack. The original “brigade” of 10 officers and 124 men operating 20 Colt machine guns in eight armored vehicles, had expanded to 422 officers and 8,343 men, in several brigades, and had enduring some 5,777 casualties. German prisoners verified horrendous casualties and damaged morale inflicted by constant machine gun fire that prevented movement, or heads above the trenches. Innumerable Canadian lives were spared by keeping the Germans pinned down. Brutinel ended the war with the Order of the Bath, Distinguished Service Order (DSO), Legion d’Honneur, Croix de Guerre, six Mentioned in Dispatches, and assorted decorations. He was far ahead of his time, and was made a naturalized Canadian by Prime Minister Robert Borden. 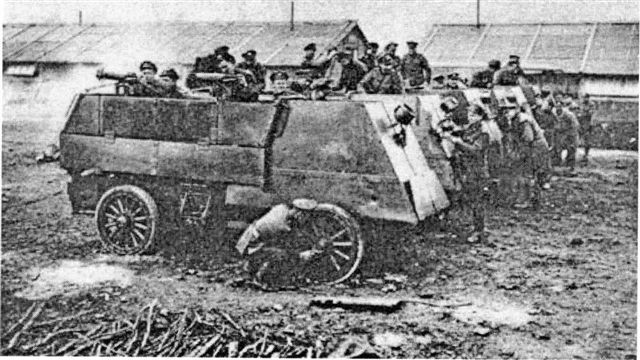 Largely unknown today, one of Brutinel’s armored cars remains in working order at Camp Borden. A plaque in his memory is mounted in Ottawa’s Chateau Laurier where the first Motors were recruited, and where their only reunion was held in 1958. A case can be made that Raymond Brutinel is the real father of mobile armored warfare and firepower. " ' Autocar ' Armoured cars were originally painted a dull blue grey, the cabs and the engines were covered in armour plating, except for the roof of the vehicle, which was open and the driver's head protruded over the top. The front of the vehicle had two headlights, and one large central spotlight for action at night. Two machine guns were mounted centrally at the rear, while steel ammunition chests, capable of holding 12,000 rounds of .303 ammunition, extended the length of both sides and enclosed the rear of the vehicle. When raised, the lids of these ammunition chests provided some protection to the gunners, nonetheless, when operating their weapons the gunners remained dangerously exposed, which resulted in high casualties in action. 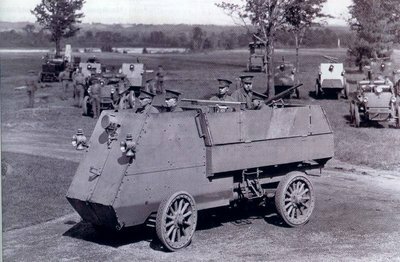 Weighing 30 cwt., the Autocar Armoured Car ran on four solid rubber tyres, and could reach a speed of 40 kph. Originally equipped with Colt machine guns, however, on 9th August, 1916 these were replaced with in favour of the Vickers machine gun.
' Autocar ' Armoured Car on display at the Canadian War Museum.